1. Peel the carrot and roughly dice it up. Chop the red hot pepper up. 2. 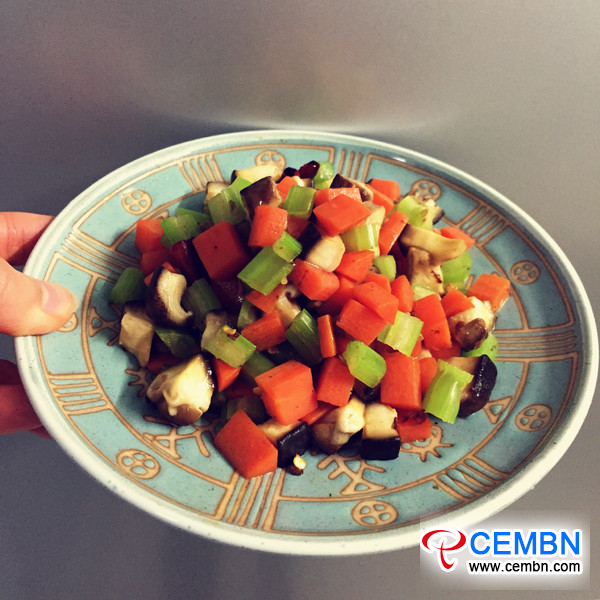 Get rid of fibre of the celery and cut it into dices. Remove the bottom portion of Shiitake mushroom, rinse the cap off and dice up as well. 3. In a wok, add a drizzle of oil, when hot, drop in bruised ginger, chopped garlic and stir till fragrant. Then drop in diced carrot and stir for 1 minute, after that, blend with Shiitake mushroom dices and fry till soft, finally let celery dices join in and go on the heat for 1-2 minutes. 4. Season to taste with a dash of salt and sugar. Serve.